THIS YEAR'S CONCERT SEASON PROMISES TO BE BOTH ENTERTAINING AND MEMORABLE. FOR THE THIRD YEAR IN A ROW WE ARE PARTNERING WITH THE CONCERT BAND OF COBOURG. COME SPRING WE ARE PRESENTING A JOINT CHORAL EXTRAVAGANZA WITH OUR GUESTS, THE WOODSTOCK-FANSHAWE SINGERS. INTERTWINE WILL SHOWCASE OVER 100 VOICES AND PRESENT ORIGINAL WORKS COMPOSED BY EACH OF THE CHOIR'S RESIDENT COMPOSERS. TAKE ADVANTAGE OF OUR SEASON SUBSCRIPTION AT SAVINGS OF 20% OFF THE REGULAR TICKET PRICE. CONTACT VICTORIA HALL BOX OFFICE (905) 372-2210. Oriana Singers originally met in 1969 to sing madrigals and ancient church music for their own enjoyment. The group was greatly supported by Covert and Helen Massie. The choir was soon invited to perform concerts and to provide choral music for church services and theatrical productions. Beryl Maguire became the founding director in 1970 and is now the choir's Director Emeritus. 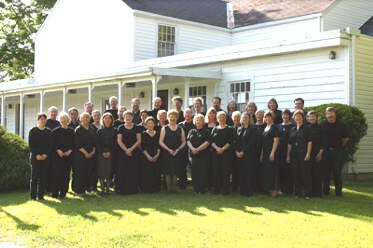 Since 1970, Oriana Singers have undertaken busy Winter and Spring seasons in the Cobourg-Port Hope area, and in various major centres in southern Ontario. They have participated in many events of local significance including the Cobourg Sesquicentennial Celebrations and the gala reopening of Victoria Hall in Cobourg. The choir has won first prize at the Oshawa and Toronto Kiwanis Festivals, performing in the Festival of Stars at the St. Lawrence Centre. Their very high standing led to their entry in the 1980 National Competitive Festival where they won the City of Lincoln Challenge Trophy as the best chamber choir in Canada. In 1985, they again entered the Toronto Kiwanis Festival where they won the Fred Everett Memorial prize for excellence in choral singing. For the 1995 Spring Concert the choir commissioned Toronto composer Ruth Watson Henderson to write a setting of Psalm 150 to celebrate the group's 25th anniversary season. Upon the retirement of Beryl Maguire, the founding director of twenty-five years, Robert Grandy, who had been co-director since 1993, became director until 1997. He was followed by Randy Mills. In 1998, Marie Anderson was welcomed as Conductor of Oriana Singers. The name Oriana dates from the era of Queen Elizabeth I of England, when the art of madrigal writing was at its peak. The name Gloriana, shortened to Oriana, was a fanciful name for the Monarch. The finest composers of the time contributed beautiful and intricate compositions to a series of madrigals known as The Triumphs of Oriana as a tribute to the Queen. Each song from the group ended with the refrain, "Long Live Fair Oriana".